There’s no reason why anyone should have to wait more than 24 hours for the money you owe them, especially people you work with. So the next time you receive an invoice from a contractor or supplier, pay it right away. Don’t wait a month, a week, a day or even an hour longer than you have to. Better still, find out how to pay them before they start any work. That way you can pay them immediately when you receive their invoice. They’ll feel good and so will you. The other day I took my younger son to Birling Gap where, at low tide, a rather dull, pebbly beach becomes an enchanted world of rockpools populated by crabs, anemones and fragile, transparent fish that dart into cracks the moment they sense danger. My son seemed disappointingly indifferent to the wonders of marine life, but later told someone that he was so happy he wanted to cry. Children are strange creatures. What a contrast to his older brother, who is virtually imprisoned by an OCD that won’t allow him to venture beyond the front door. It has taken me a while to realise how much my son’s condition has changed our lives. Unlike an accident or conventional disease, Obsessive-Compulsive Disorder can assimilate itself so insidiously into the sufferer’s world that even their family can’t always recognise the huge tectonic shift that has taken place. Why does one child possess the capacity for happiness whilst another is wretched? In my sons’ case, the glib answer would be that the world is a much happier place when you’re six than it is at 12, but I don’t think that’s the answer. Even at six, my oldest son was a troubled soul. 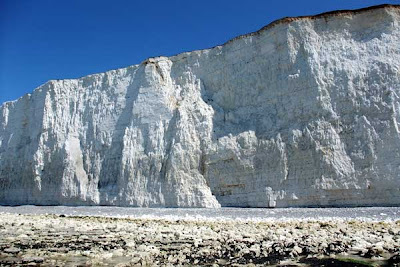 On the beach, I looked up at the cliffs and marvelled at the fact that they were made up of the skeletons of countless billions of marine creatures. 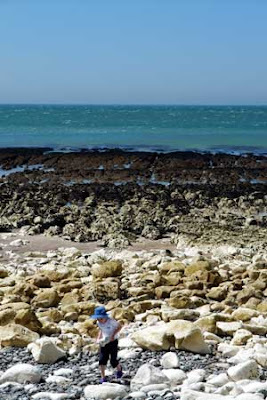 On the clifftop, tiny figures walked along a thin, grassy topsoil, probably unaware that the solidity of the landscape was the result of so many forgotten, insignificant, prehistoric lives. I looked at my son. What would he remember of this day, if anything? But did it even matter? Perhaps the sum total of who we are is like sedimentary rock, largely comprised of invisible, forgotten events that have helped to silently create solid foundations. 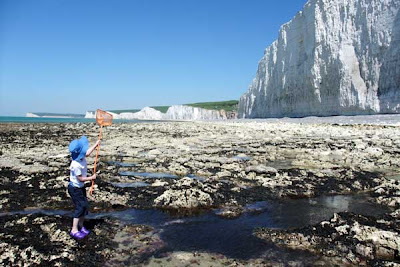 But I’d done all of these things – the rockpools, the forest walks, the zoo and the museums – with my oldest son, and they hadn’t created a bedrock of security. If I could go back, what would I change? I can’t think of an answer. In many ways life has become very challenging. I have had to give up a secure job for the uncertainty of sporadic, freelance work. My wife and I now pass like ships in the night, taking it in turns to spend time with our oldest son. We aren’t the house of spontaneity. However, I feel quietly hopeful. The OCD has been very powerful, but it is no match for a neighbour’s Border Collie that appeared one day on the doorstep, demanding to be taken for a walk. After witnessing several professional strategies fail, it was a surprise to see a dog have such a huge impact, but in many ways it made perfect sense. The front door has been breached. The next phase will involve territorial expansion: a street corner today, the postbox tomorrow and the end of the road by Friday. But the dog may have its own ideas, guided by unknown smells and hidden memories. My son will follow the dog. I’ve no idea what will happen next, but I’m now resigned to a life of living in a house that smells of dog, out in all weathers so that an incontinent canine can relieve itself. Long flights are great to sleep. Or to take care of missing documentation for projects. And that’s exactly what I did in this last flight to SF. So here it is, BBCyclingLabel along with a demo video and some proper documentation.